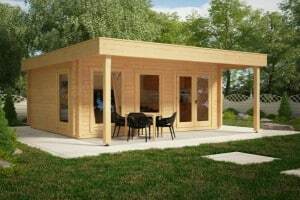 How Can You Get a Wooden Garden Office within Affordable Costs? Why commute every morning through heavy traffic if a walk through the garden into your own fancy garden office could do the trick? In these times of change, many get the opportunity to work from the comfort of their homes in their contemporary garden offices. We introduce seven of our best garden offices for you to choose from. This stylish flat roof building is the smallest model of the Hansa Lounge family and is the best choice to fit into tight garden spaces. Four large double glazed floor to ceiling windows make the insight gleam with natural light, and you can work with a view into your beautiful garden. 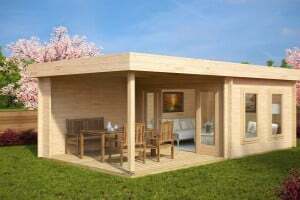 This contemporary garden office room has sturdy 44mm walls with double tongue and groove joints, extra strong roofing felt and even boasts a roofed veranda where you can sit outside during your creative breaks and get some breaths of fresh garden air. 9m2 of working space is more than enough for a single work place and you could even fit a sofa in there. The best of all is that you don’t need to worry about planning permissions as long as you are able to situate the building within 2 metres of your boundary as the roof has an outside height of just 2.35m, and with this, it is well below the 2.5m allowed without a planning permission. With 12m2 of light and elegant space, Eva B features a French door and three long windows with picturesque glazing bars, and makes a perfect contemporary garden office for you with all the space for your work place with cabinets and equipment plus a large sofa if you like to relax and enjoy the view of your garden during your breaks. Eva B is currently on sale so if you are looking for much bang for your buck you have just found the perfect opportunity. 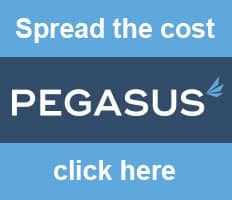 The price has been reduced by more than a staggering £700.- and all you need is buying and building the set together which will take you just two days as a person with an average DIY experience. Don’t worry about planning permission as the roof is under 2.5m high. 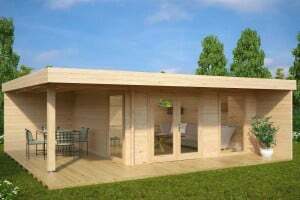 This simple but stylish construction offers 12m2 of space and is not as open to the environment as the Hansa line of contemporary garden offices. It invites light through two fixed windows next to the fully glazed double sliding doors forming the entrance. If you like your work space a little more secluded without neighbours being able to peep in from the sides, then this Scandinavian-style contemporary garden office with sturdy closed 44mm walls of shiny, light and durable Northern Spruce might be the right choice for you. During hot summer days you can leave the sliding doors open allowing the oxygen-rich garden air in. 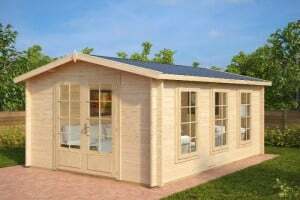 Of course, you can use this summer house also as a hobby room, a guest room, a room for the kids, or a comfortable garden lounge to relax after work. For your safety the doors have a cylinder lock and the whole building comes with a five-year guarantee. With no canopy, the room is fully used for the spacious inside and the flat roof has a ridge height of under 2.5m high to comply with planning restrictions. What’s more: We can change all buildings in size, style, number of windows according to your needs and preferences. You have just a tight space in the garden, but still are looking for style and a decorative element? Then Anita M might be just right for you. This very popular small summer house features a gabled roof with black roofing felt included for no extra money and a large, French double door with large windows which give it the more traditional Scandinavian charm that simply looks good in every garden. Its 5m2 provide more than enough space for a work station plus a comfy armchair for a unique value-for-money ratio. This big brother of the Mini Hansa Lounge has about the same floor plan but provides much more space with 14.5 m2. This contemporary garden office has all the space filled with natural light you need for your work or even to invite guests or business associates for an elegant dinner under the large canopy. Of the five windows, only the two large ones with 1.85m height are fixed, while the others are opening. And of course, the large fully double glazed double doors also allow a lot of light into the inside. The 44mm walls can easily be insulated and you can work, sleep or party all year round in the sleekest garden room in the neighbourhood. Like its little sister, the Hansa Lounge XL has a roof height of under 2.5m to comply fully with current planning restrictions. With its 18m² of space and generous 1.5m canopy, this contemporary garden office possesses all the effortless versatility you could wish for from a garden room. You could use this spacious garden retreat as an office, a workshop, a garden lounge, a studio, or to accommodate teenagers or guests. The Ian E has extra thick 50mm walls and double glazing in all windows and doors and can easily be insulated and fitted for all year use. 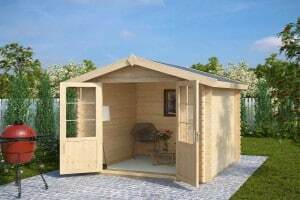 Please use our guide for easy DIY insulation of your contemporary garden office. This is your option for all year round comfort without any stress over planning permission, as the roof is under 2.5m high. This contemporary garden office is a perfect place to welcome business friends for outside Alfresco dining on warm summer nights under the spacious canopy of the large veranda. With 9m2, the inside is just right for a single work place and draws lots of natural light through two opening windows of 1.43m height plus the large double part glazed sliding doors. On the veranda, you are shielded by a wooden wall on one side for more privacy and weather protection. 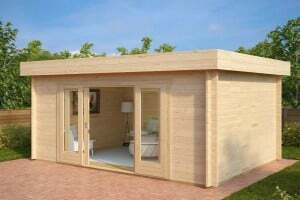 Like all our contemporary garden offices, the Lucas E boasts treated foundation joists, wind braces, an assembly kit, real glass in windows and doors, and a five-year guarantee. And it is another building with its roof under 2.5m high. 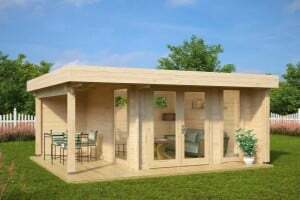 So, with these 7 contemporary garden offices, you can easily bypass planning permission, and ensure that you will be able to commute to work through your garden into one of these stunning garden buildings. If you would like to search for other models with roofs under 2.5m high, you can look through our selection of contemporary garden offices under 2.5m.